Less people travel to Morocco in 2016. These are the official figures from the Moroccan Tourism Observatory. But why? Why are travelers avoiding a land rich in cultural diversity, stunning landscapes and natural- born hospitality? We cannot help but wonder if the kingdom’s location in Middle East North Africa ( MENA) region may have something to do with it. After all, the region is no stranger to terrorist attacks, civil unrest and political instability in recent years. Whenever a new attack is carried out, many potential travellers stay away from Morocco too, simply because it’s in the ‘same’ part of the world. But is it really the ‘same’ ? The chief editor of a Moroccan newspaper agrees : ‘Morocco is a victim of its location. Many tourists mistakenly think that the terrorist threat is more important in a Muslim country in the MENA region (Middle East and Maghreb). But despite all this, foreign tourists have no reason to worry, given that since the emergence of ISIS and its supporters around the world, there was no attack in Morocco.’ And it is the terrorist attacks and political instability that have made other countries in the region see a drop in tourism by up to 40 % compared to previous year. # The UK based Independent magazine has compiled in July 2016 a map of the most dangerous countries in the world by collating the foreign office travel advice for all countries in the world. On that map, Morocco is as dangerous as say Denmark or Canada. # The Global Terrorism Index measures the impact of terrorism in 162 countries. To account for the lasting effects of terrorism, each country is given a score that represents a five year weighted average. On this index, Syria ranks #5, United States ranks # 35 and Morocco ranks 92 out of 163 countries. # According to the Global Terrorism Database, published by the National Consortium for the Study of Terrorism and Responses to Terrorism (START) at the University of Maryland, terrorist attacks in the Maghreb region multiplied by 47 times between 2011 and 2014, increasing from 15 to 1,105. Of these attacks, only one targeted Morocco. # According to the French Ministry’s “Travel Advice,” which was recently updated following the suicide bombing that shook Istanbul, Morocco is the only recommended country for French nationals to visit in the MENA region. # In 2015, the popular Trip Advisor travel website’s users have chosen Marrakech as the top destination in the world. Furthermore, in the 2016 Travelers Choice, Marrakech was Africa’s top destination. # The US State Department lauded Morocco’s “comprehensive” counter-terrorism strategy, underlining the country’s adherence to human rights standards and the increased transparency of law enforcement procedures. Among other things, the report states that: “in the past decade, Morocco has focused on upgrading mosques, promoting the teaching of relatively moderate Islam"
It is without a doubt that Morocco owes largely its political stability and social security to its king. Having taken on the throne from its father King Hassan 2 in 1999, Mohamed 6 enacted social reforms, including important steps towards gender equality and migrant integration. In August 2016, the King Mohamed 6 took publicly a stark stand on terrorism and was one of the few, if not the only, chief of state from outside the Western world, to publicly condemn the murdering of innocent people and outcast those who perpetrate these in the name of Islam. "Is it conceivable that God could order someone to blow himself up or kill innocent people? Islam, as a matter of fact, does not permit any kind of suicide - whatever the reasons or circumstances." Mandy Sinclair, owner of Tasting Marrakech (food and cultural tours of Jemaa el Fna) has been living in Marrakech for 6 years. While she agrees that the world in 2016 is a less safe place to travel, she feels safer in Morocco than in Europe or the US, although she prefers the less- than- obvious locations: ‘The initiatives the government is taking to ensure the safety of its people and travelers is second to none. As a single woman living in Marrakech, I feel safer here than in most major European and North American cities. I travel frequently around Morocco and always feel at ease, especially in smaller villages in the Atlas Mountains, Moulay Idriss and Essaouira’. At the same time, countries such as Spain and Portugal have seen almost record number of tourists these past 2 years. Does that mean that you should feel safer in Spain or Portugal than you would feel in Morocco ? Travel writer Alice Morrison agrees: ‘Unfortunately, I don’t think it is 100% safe anywhere in 2016. What I can say is that I feel as safe living here in Marrakech as I would in the UK. I was actually more worried going to London a couple of weeks ago and getting on the underground, than I am going down to the Medina here.’ Alice Morrison is an adventurer who has lived in Marrakech since January 2014. She, of all people, has some insight into Africa, since she crossed the continent on a bike, a race of 8000 km and has written a book about it. Personally, I could say that the seeds for this article were planted during conversations with our guests at the end of their private tour of Morocco. In the shade of their riad in Marrakech, most of them would relate the same experience. ‘Cristian, I know we asked a lot of questions before travelling to Morocco as we were a little worried about the safety here. But we want you to know that we hardly felt any safer and more welcomed anywhere else we travelled before’. That raised a question: how many other travelers like them felt that initial apprehension and never venture? When the grim statistics were published in July 2016, I decided it was about time to publish the long- due article and get people involved. And I thought the best is to start by researching how thorough the Moroccan authorities have made Morocco safer, on the ground. If you journeyed to Morocco in the last two years, you may have noticed police and military patrol the streets in groups of 3. Scanning devices have been installed at hotels, restaurants and malls entrances. 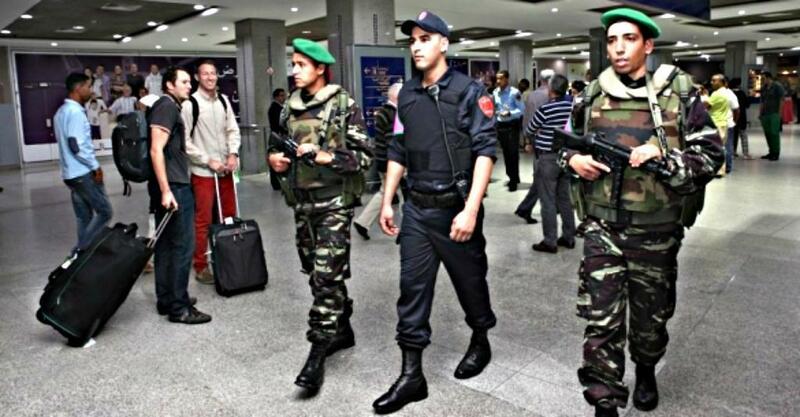 Thorough checks are in place at airports across Morocco. In the local media, many terrorist cells have been dismantled in the past 18 months. But this is merely the tip of the iceberg. The Moroccan government has treated counterterrorism as a top policy priority since 2003. In June 2015, the Government of Morocco enacted significant amendments to the criminal code to address the foreign terrorist fighter phenomenon. To further show that Morocco is serious about combatting terrorism, it has created a law enforcement agency that deals specifically with terrorism threat: The Morocco Central Bureau of Judicial Investigation (BCIJ), nicknamed ‘the Moroccan FBI’. As about its efficiency, the BCIJ has dismantled quite a few terrorist cells since its creation. Law enforcement officials and private carriers work regularly with the United States to detect and deter individuals attempting to transit illegally. At the end of 2014, the parliament voted to support the Council of Europe Convention on Laundering, Search, Seizure, and Confiscation of the Proceeds from Crime and on the Financing of Terrorism. On the other hand, one of the most important measures taken by Morocco in recent years was the creation of the new security mechanism “Hadar”, which incorporates elements of the Royal Armed Forces, Royal Gendarmerie, the Police, and Auxiliary Force. In the past decade, Morocco has focused on upgrading mosques, promoting the teaching of relatively moderate Islam, and strengthening the Ministry of Endowments and Islamic Affairs (MEIA). The MEIA is educating Morocco’s nearly 50,000 imams in a version of relatively moderate Sunni Islam. Besides the security measures and the counter radicalization of the mosques, the Moroccan authorities understood that the radicalization of some youth stems from lack of opportunities and unemployment. The Moroccan government engaged in a policy of heavy public investments in infrastructure and the social sector with the ultimate goal of fighting poverty. According to a study published on the Carnegie Middle East Center in 2010, Morocco succeeded to lift 1.7 million people out of poverty during the period 2000-2010. The same study shows that poverty rates in the country decreased by more than 40 per cent during the same period. SO WHERE DOES THE CONFUSION COME FROM ? Patrick Simon is vice president of Regional Tourism Council of Guelmin – Semara region in the south of Morocco and owner of Dar Infiane guesthouse. Of French origin, he has lived in Morocco for 41 years. He agrees: ‘I’d like to point out that the regular press releases claiming good results in the dismantling of terrorist cells was a choice of the government and especially the Ministry of the Interior, thus insisting to show nationals and tourists that all means were used to ensure maximum security’. So it seems that the security forces are very good at doing their job and like to convey it to the press. In the long term, it's still to be seen whether the transparency is the best policy in this case. Did you visit Morocco in the last 5 years ? Did you feel safe ? Did you fear for your safety ? We've created a special platform for you to vote and/ or leave your feeback here. © Sun Trails 2016. All rights reserved. No part of this interview may be reproduced, distributed, or transmitted in any form, including photocopying, recording, or other electronic or mechanical methods, without the prior written permission of the publisher. With a passion for travel and particularly Morocco, I co own and manage Sun Trails. Morocco - best time to visit ? We are open 7 days a week from 9 AM to 5 PM local Morocco time. For any last minute enquiry feel free to call us on the number(s) listed above.